Review of Cuvée des Jacobins Rouge | Beer Apprentice - Craft Beer News, Reviews, Interviews and Info. Hello again everyone. 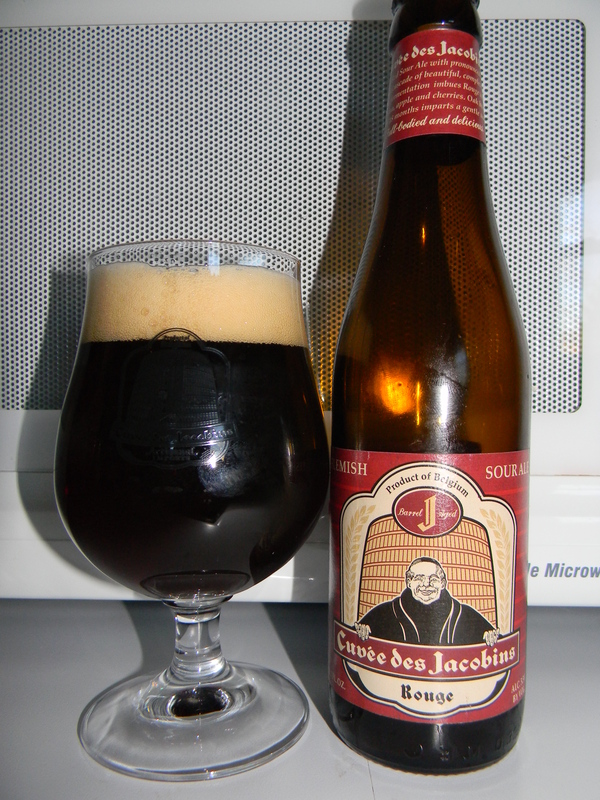 For today’s craft beer review I’m going to be trying the Cuvée des Jacobins Rouge brewed by Brouwerij Bockor N.V. located in Bellegem-Kortrijk, Belgium. This will be my first beer ever from Brouwerij Bocker and from all I’ve heard they brew some really great stuff. Let’s get to the website, bocker.be, and see what kind of information we can drum up about this particular beer. I’m ready for a sip or two. How ’bout you guys? This beer came in an 11.2 oz. bottle and it had an ABV of 5.5%. It poured fairly clear with an extremely deep ruby color and a very, very light tan head. It formed to a nice size. It was a touch fizzy, but rather smooth. The retention time and the lacing were somewhat slight, but it still looked pretty good standing in the glass. The bouquet was great!!! Hints of soured cherries with undertones of wood. Tones of vinegar and slight wafts of musty barnyard too. Some earthiness, yeast and bread began to develop as the brew warmed a little. It could have just been me, but I even thought I smelled a meager amount of chocolate. I wasn’t expecting that. The taste popped with those sweet and sour cherries. Quite wine like. They weren’t overly tart or acidic, however they definitely made the lips pucker a bit. Some woodiness really helped balance the vinegar and sourness most commendably. On the back end I picked up on savors of ripe red apples too. Very, very nice. The mouthfeel was medium bodied. Dry, refreshing and kind of sharp, but mostly smooth at the same time. The carbonation was fairly lively, which helped contribute to a very long finish. Tons of flavor was left drenching the palate long after each sip. Well, I felt that this was a great beer. Most definitely a beer to try if you favor the Flanders Red Ale style. It had a super drinkability too. It went down with remarkable ease. I believe that it could be enjoyed at anytime of the year, but I’d probably enjoy it best during the Summer. Either way, I’d have no trouble drinking it no matter what time of year it was offered. That’s about all that needs to be said really. So, pick up a bottle of the Cuvée des Jacobins Rouge and enjoy. Let me know your opinion when you do. I hope that you appreciate it as much as I did. Thanks for reading and commenting everyone. I’m grateful.